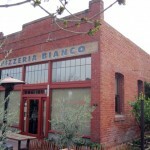 The architectural variety in Heritage Square is astounding — from the clean lines of the Arizona Science Center to the bricked fortitude of Pizzeria Bianco, there are no two buildings alike within the space. The Rosson House is no different. 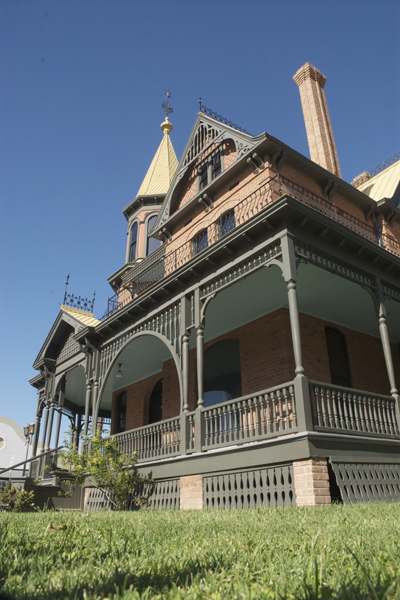 Built in 1895, the Rosson House is one of Phoenix’s original homes, and it is one of the only remaining examples of a brief Victorian architectural influence that swept into (and quickly out of) town in the late 1800s and early 1900s. Perhaps the most striking building in Heritage Square (not to downplay the Science Center’s monolithic presence or the Teeter House’s understated charm), the Rosson House is now a museum dedicated to preserving and displaying the history of Heritage Square and the house itself. Specifically, the museum focuses on the period of 1895-1915, when architect A.P. Petit was drawing up plans for structures that quite simply didn’t skimp on the details — ornate structures with soaring cupolas, hand-carved detail work and a great variety of materials. The Rosson House is his only remaining structure. 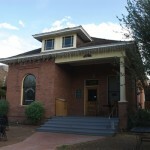 Dr. Roland Rosson was the original owner of the home, and at one point in time he was the mayor of Phoenix. After his time with the city, Dr. Rosson began to summer elsewhere and rented the home for half the year to National Herald Tribune editor Whitelaw Reid. Over the years, the home also became known as the Whitelaw Reid House, but that alias has largely been forgotten since the home became the Rosson House Museum. Reid summered in Phoenix, but another one of his homes in Ohio is listed on the National Register of Historic Places as well. The Rosson House was officially placed on the National Register of Historic Places in 1971. 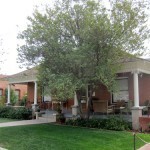 The Rosson House is available for tours. See its website for full details, or call 602.262.5070. Thanks for the historical perspective! Next time I’m down in the area, I’ll be sure to look for the house once owned by a mayor of Phoenix. 🙂 Nice work! You’re doing a terrific job on this series of articles, lots of interesting stuff. Its sad that Phoenix used to have lots of Victorian homes and we lost so many. There’s a cool one on 2nd Ave half way between VB & Fillmore thats sorta Victorian which may warrant a future investigation/article. Also theres the weird ‘onion dome’ house on Washington 11th Ave, Im not sure if its strictly Victorian either but its neat. Though I have to say the AZ Science Center is a really awful building. It would make a neat sculpture or paper weight, but as a building in the desert its a total failure, much like Predocks equally awful ASU Art building. Whos bright idea was it to build a treeless, shadeless, grey concrete highly reflective building in the desert? The Science Center also totally turns its back to the outer streets, bleck. No more hiring out of state starchitects to do local civic projects, it seems like we always get burned (Science Center, Federal Courthouse). Thanks for your comments, Will. I’m aware of the 2nd Ave house, and I have tried to find info on it. Perhaps I’ll dig a bit deeper, as I’ve always been interested in that one as well. I also have to agree about the Science Center. Local architects would be a great start.